Hill’s® Science Diet® has a whole selection of gourmet cat food, special cat treats, and dry cats foods that just might help you give your special kitties a little extra during the upcoming holiday season and beyond. of the 20 lucky winners. And what better way to share something special with your kitty than by trying your chance to win. It seems like fine food and the holidays go hand in hand. And many of us want to extend these celebrations to our feline friends, as we look for ways to give them a little extra TLC and fine cuisine, extra treats, and new playthings for their enjoyment as well as ours. Gourmet implies exceptional quality, well prepared, fine ingredients, sophistication, and fit for royalty (and aren’t our cats just that) and fine food connoisseurs around the world. As the holidays are upon us, we humans are looking for a way to share their pleasures with our special felines. What better way of doing this than entering for your chance to win one of the 20 gift baskets. This will allow you and your kitty to indulge in Hill’s healthy cat food, which also can be quite tasty as well. According to Matt McMillen’s pet health feature on Pets.WebMD, com, “What You Need to Know About Feeding Your Cat, because cats are carnivores, their dietary needs are very different from those of dogs and humans. Moreover they do not process carbohydrates well. That article suggests that when you chose a cat food, check that the label to make sure it meets the standards set by the American Association of Feed Control Officials (AAFCO) . That ensures that the food meets at least the minimum nutritional needs of your cat. Once you’ve made your choice, let your cat do a taste test to see if kitty likes it. 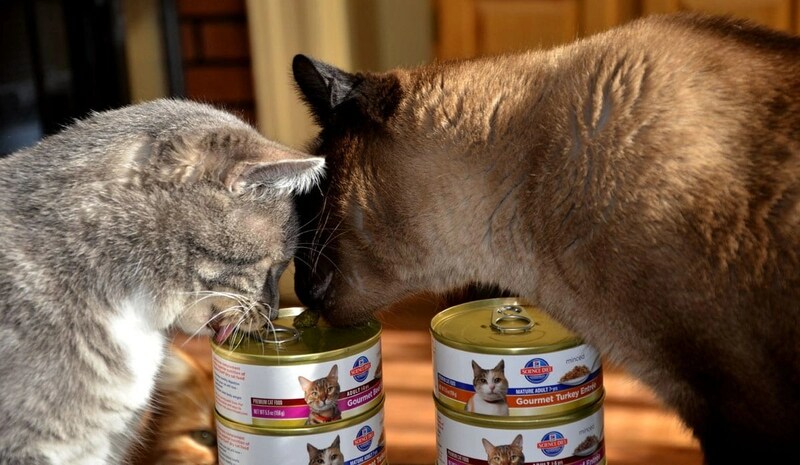 Canned food can be a real treat for your kitties. Hill’s gourmet turkey and beef can give your cat a change of pace. Mixing it with dry food, such as Hill’s grain free cat food, is also an option. For another indulgence, give your kitties some cat treats during the day, or after you return from a hard day at work. When your cat purrs and meows around your feet, she’s telling you that it’s time for attention. Food is just one part of that. It’s time for TLC, loving stroking pets, talk time and some special treats. Remember, treats aren’t just for dogs. Our felines like them just as well. Hill’s® Science Diet® Crunchy Creations™ Grain-Free features two varieties for kitty: one with chicken; the other with salmon. Hills suggests having the cat treats in a convenient place so you can pat her on the head and hand her treats showing kitty how special she is. Paws’ mom has been using Hill’s® Science Diet® for over ten years, having used their specialty health foods, as well as their regular cat foods. 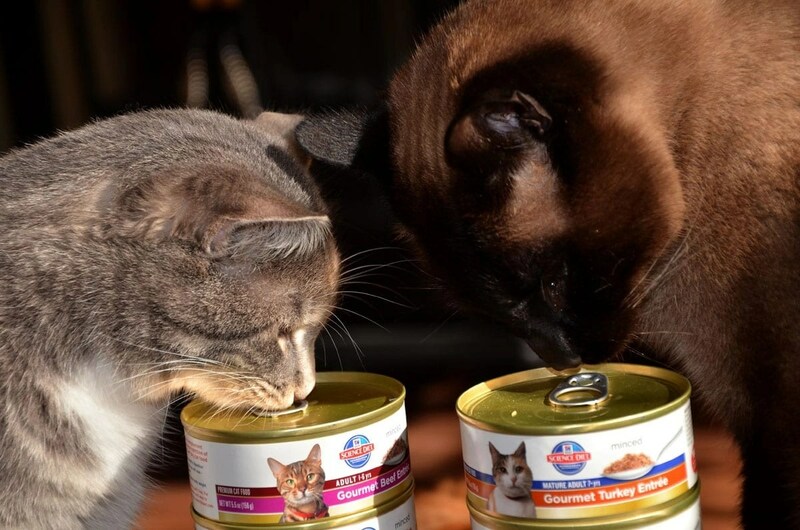 It has worked for these kitties, but Paws for Reflection acknowledges there are many strong opinions when it comes to choosing the right food for your cat. While this is our opinion, it may not be shared by everyone. Paws’ would not endorse any foods or treats that our feline family would not use ourselves. Don’t forget to enter for your chance to win one of 20 Hill’s® Science Diet® gift baskets. Just send Paws your email address and shipping address in the contact form, and put Hills gift basket in the subject line. Winners will be drawn after midnight on Dec. 2. Winners will be notified via email. Contest rules are set forth here. Paws for Reflection will post a photo of the gift basket once photos are available. 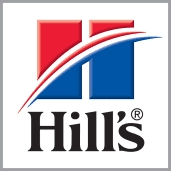 This post is sponsored by Hill’s. I am being compensated for helping spread the word about Hill’s Science Diet for Cats, but www.bjbangs.net (Paws for Reflection) only shares information we feel is relevant to our readers. Hill’s Pet Nutrition, Inc. is not responsible for the content of this article. Do you treat your cats to gourmet, special foods during the holidays? Have you used Hill’s crunch treats or gourmet foods? Are you planning to give your cat a special gift for the holidays? How does your cat spend Thanksgiving, Christmas, Hanukkah, and New Year’s? Also chime in with what you think of give-aways. Please share. I only feed my cat Science diet. Since I started when he was a kitten it’s all he knows. At that time the only kitten flavor was chicken which was fine since I planned on only feeding him one flavor anyway. When he switched to adult I gave him chicken. At Thanksgiving I gave him gourmet turkey and he really liked it so I switched him to turkey. I also give him dry food. He doesn’t seem to care for treats, he prefers his food in a dish. He likes to se what I’m eating and will often take 2-3 bits of food, it’s almost like he knows not to overindulge. I give him a Christmas present, usually a toy, but he would prefer a pom pom. Last year I tossed a whole handful to him; he was so funny-he didn’t know which to chase first. I don’t know how I’ll top that. Send me your address and email. You are one of the finalist in the drawing for 20 baskets.